Bella Phillips is a wonderful teammate and an outstanding volleyball player. She is a key reason that the Penn Volleyball Team has been ranked in the Top 10 most of the season. Phillips, a Junior, is always on the court and always trying to improve her game. Once school volleyball ends, she goes into travel volleyball. Her focus right now is Penn Volleyball. 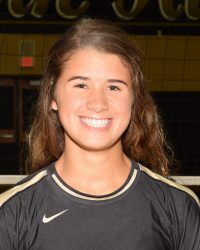 ¨The team at Penn is just so fun to be around, the chemistry is great and everyone is hardworking,¨ said Phillips, who soars above the net and delivers devastating kills for the Kingsmen. The team’s ultimate goal is to win state, but they are also on the road to the NIC Championship. This year the volleyball team got a new coach, Lisa Pawlik. Phillips explained how at the beginning of the season it was a challenge for her and her teammates to trust the new coach, but now she forgets that it’s Coach Pawlik’s first year back because of how close the team has grown. Phillips first started playing volleyball at the age of 10, because her friend’s parents thought she would be good at it. ¨It has been an amazing trip,¨ Phillips said. Coach Pawlik, who led Penn to a state title in 2010, is impressed with Phillips’ ability. ¨Bella is a rising star,¨ Coach Pawlik said of the Kingsmen Junior. Coach Pawlik explains how Phillips is dedicated to improving and works hard to be the best player she can be. ¨She truly enjoys the game and it shows in her play¨ says Coach Pawlik.